As cloud storage becomes more affordable, physical storage media Blu-rays are quickly becoming a thing of the past. And as you see, the new codec H.265(also known as HEVC) is twice as efficient as H.264. In general, H.265 has several big advantages over H.264 including better compression, delicate image and bandwidth saving. Therefore, when you make digital copy of your DVDs, why not convert them to H.265 for saving cloud storage space and keeping original quality? In this article, we will walk you through how to convert DVD to H.265 MP4 video files. To encode and rip DVD to H.265 MP4 quickly and easily, here EaseFab LosslessCopy is highly recommended. This program features high efficiency and seamless conversion. It can effortlessly bypass all the copy protecion of commercial DVD discs and region code and help users convert DVDs to H.265 MP4 with 50% output size reduced and original quality kept. What's more, it has a built-in optimized profile bank which covers all the mainstream video formats MOV, MKV, FLV, M4V, WMV, MPG, 3GP, and popular devices iPad, iPhone, Galaxy Tab, Microsoft Surface RT/Pro and more. Thanks to the built-in video editor, you can personalize and retouch your videos in clicks. 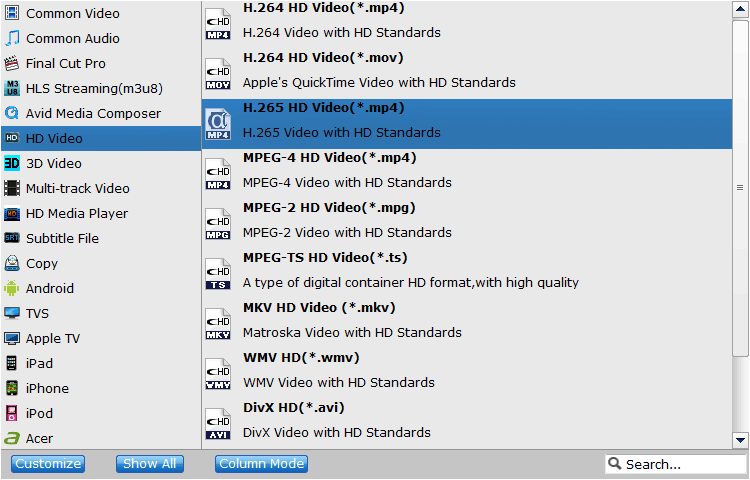 Download the program and learn how to rip and encode DVD to H.265 video. PS: EaseFab LosslessCopy, the best Blu-ray/DVD to Lossless MKV solution, is a powerful program with the ability of backing up Blu-ray/DVD collection to multi-track MKV without quality loss, ripping BD/DVD movies to MP4 and MOV with multiple audio streams, and converting BD/DVD from hard discs to virtually any popular video and audio format so that you can freely watch movies on multimedia devices. Insert the DVD disc to your computer drive and then click the Load Disc button to have DVD movies uploaded to EaseFab LosslessCopy. You can also import Blu-ray discs, Blu-ray/DVD ISO files, IFO files or Blu-ray/DVD folder for conversion. Click on Format bar, select "Common Video" from the format list and in submenu you can find "H.265 Video(*.mp4)". The hit on the small folder icon to specify an output folder. You can also select "HD Video" > "H.265 HD Video(*.mp4)". Click "Convert" button and the program will rip DVD movies to H.265 mp4 video immediately. You can easily find the output files in the output folders once the conversion is done.